AND THE WINNER IS… INSTAGRAM! The numbers are in and Forrester Research declared Instagram the champion of social engagement. “Instagram delivered brands 58 times more engagement per follower than Facebook and 120 times more engagement per follower than Twitter,” said Nate Elliott, the vice president and principal analyst at Forrester Research. For instance, in March 2013, Red Bull posted a snowboarding video on both Facebook and Instagram. However, despite posting the same content on separate platforms, the video garnered a measly 2,600 Facebook likes (a 0.0006% likes-per-fan rate) versus 36,000 Instagram likes (a 3% likes-per-follower rate). A consistent leader in Instagram brand account is the sneaker giant, @Nike; their followers grew by over 40% in the last eight months to a little over 7.68 million followers. @Nike masterfully harnessed the power of social media through the Nike PhotoID experience, where followers customized their Nike Air based on the colors of their favorite Instagram photo. Rather than posting staged products, they focus on fostering community through their hashtag campaigns (#MakeItCount and #NeverNotRunning) and motivational captions, all the while ensuring all posts match the Instagram aesthetic. 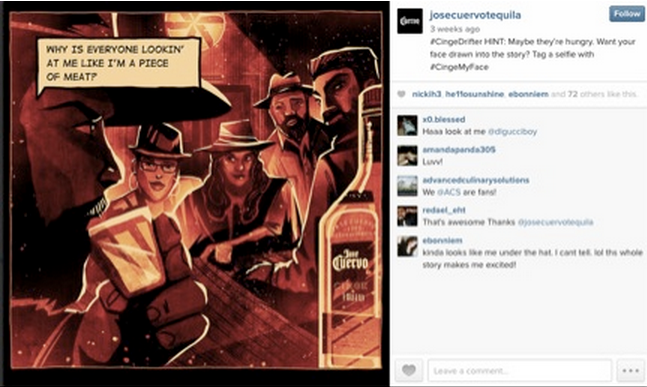 Another brand that smartly embraces and creatively capitalizes on Instagram’s UX is @JoseCuervoTequila. Just in time for Halloween, @JoseCuervoTequila published one frame per day of their “terrifyingly hilariously terrifying graphic novel,” Drifter: Red Moon Over Baja. The inventive campaign not only showcased their new product, Jose Cuervo Cinge, but also the names and illustrated likeness of Cuervo fans. 21+ consumers simply shared a selfie and tagged it with #CingeMyFace. Although many brands are winning without putting money behind their content, Instagram gently rolled out sponsored posts in 2013, which increases a brand’s reach by pushing the posts to users who do not follow the brand. -the ad amassed 218,000 likes, a 370% increase in average engagement compared to the previous 5 non-promoted posts. -@MichaelKors totaled 33,985 new followers, adding nearly 16 times as many followers compared to non-sponsored posts. With fewer millennials engaging with Facebook as a whole compounded with Social@Ogilvy’s prediction of Facebook Zero — where a brand’s organic reach is predicted to hit zero in the near future — Instagram presents reach opportunities that brands can’t afford to ignore. Not only does Instagram boast an international base of 200 million active users each month, but 50 million of them also signed up within the first six months of 2014, thus implying an impressive growth rate for 2015. Capitalize on the Instagram’s enormous reach by connecting your product with the platform’s native talent and major influencers for their eye, experience, and, of course, their followers. These photographers hold a tremendous amount of authenticity and credibility with their fan base. Effective branded posts fit organically into a user’s feed; it should feel as though someone is sharing a personal and intimate moment rather than a staged shoot. The most successful photos are the ones people feel like they can take themselves. What it boils down to is this: Create engaging concepts, couple it with beautiful images that resonate, and you’ll increase your brand awareness by reaching potential new followers and new customers. While Instagram is not the silver bullet in connecting with an increasingly distracted audience, it’s a great place to start. Want some free thinking on this? Let us know.